Even an impromptu visit from Gov. Chris Gregoire and a comedic anecdote from Washington State University football coach Mike Leach about living in a trailer covered floor-to-ceiling in red shag carpet couldn’t steal Ron Hue’s thunder Saturday night. The longtime Tri-City Water Follies volunteer was named Tri-Citian of the Year at the annual award banquet night for his “contagious enthusiasm” for the local community. Hue, branch manager for HAPO Community Credit Union, received the award at the Three Rivers Convention Center in Kennewick surrounded by family, friends and many admirers. “I’m speechless,” he said as he hugged master of ceremonies Fran Forgette shortly after the announcement. Hue’s expression as he took the stage alongside his family — and the one-time best man at his wedding who drove to Kennewick from Arizona — was one of surprised humility. “This is when you need to hire an attorney because you need someone to speak for you,” Hue told the audience of Tri-City leaders. 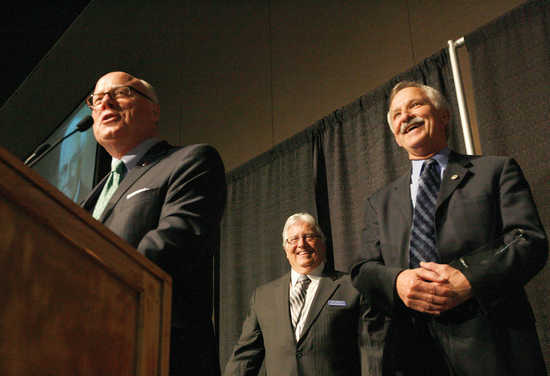 Hue, a former Kennewick Man of the Year, received the S.T.A.R. (Service, Time, Attitude and Reliability) Award last month from the Tri-City Regional Chamber of Commerce. He is a lifelong Tri-City resident with a decades-long history of volunteer work, including 33 years as a year-round volunteer for the Water Follies, including helping keep the popular summer event afloat when lack of sponsorship threatened its continued existence a few years ago. In addition to the Water Follies, he serves on the boards for the Columbia Center Rotary, Tri-Cities Cancer Center Foundation, Circle of Hope drug court, Tri-City Regional Chamber of Commerce and Tri-Cities Visitor & Convention Bureau. “Ron rarely talks about what he does and never seeks accolades. His passion to help others is contagious, which generates countless results throughout our community making it a better place for all,” his nomination letter said. Last year’s winner, Skip Novakovich, said Hue embodies the famous lines from President Kennedy’s 1961 inaugural speech about giving to the nation and working together for the freedom of man. “Ron Hue is a true community servant and a fitting person for us to honor tonight,” Novakovich said. The 90 minutes or so leading up to the announcement included a surprise visit by Gregoire, who was attending the Washington State Patrol Memorial Foundation Dinner in the next room. The night also included a 30-minute speech by Leach. The erudite coach talked about how he transitioned from a law student to a football coach and shared some stories of his struggles along the way, which include time spent living in that one-bedroom trailer with his young family. His ultimate lessons were to maintain balance in life, follow your passions and give your best.